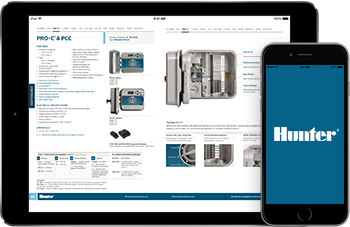 Hunter products and specifications at your fingertips on any device. The new Hunter Industries Resources App for iOS and Android allows you to download the catalog directly to your smartphone or tablet for future access without an internet connection, so you can access the Hunter catalog anytime, anywhere. Click the buttons below to download the iOS or Android App.